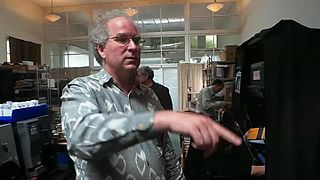 Brewster Kahle (/keɪl/ KAYL; born October 22, 1960) is an American computer engineer, Internet entrepreneur, internet activist, advocate of universal access to all knowledge, and digital librarian. Kahle founded the Internet Archive and Alexa. In 2012 he was inducted into the Internet Hall of Fame. Kahle grew up in Scarsdale, New York, and went to Scarsdale High School. His father was a mechanical engineer. He graduated from the Massachusetts Institute of Technology in 1982 with a Bachelor of Science in computer science and engineering, where he was a member of the Chi Phi Fraternity. The emphasis of his studies was artificial intelligence; he studied under Marvin Minsky and W. Daniel Hillis. After graduation, he joined Thinking Machines team, where he was the lead engineer on the company's main product, the Connection Machine, for six years (1983–1989). There, he and others developed the WAIS system, the first Internet distributed search and document retrieval system, a precursor to the World Wide Web. In 1992, he co-founded, with Bruce Gilliat, WAIS, Inc. (sold to AOL in 1995 for $15 million), and, in 1996, Alexa Internet (sold to Amazon.com in 1999). At the same time as he started Alexa, he founded the Internet Archive, which he continues to direct. In 2001, he implemented the Wayback Machine, which allows public access to the World Wide Web archive that the Internet Archive has been gathering since 1996. Kahle was inspired to create the Wayback Machine after visiting the offices of Alta Vista, where he was struck by the immensity of the task being undertaken and achieved: to store and index everything that was on the Web. Kahle states: "I was standing there, looking at this machine that was the size of five or six Coke machines, and there was an 'aha moment' that said, 'You can do everything.'" Kahle is a member of the Internet Hall of Fame, a Fellow of the American Academy of Arts and Sciences, a member of the National Academy of Engineering, and serves on the boards of the Electronic Frontier Foundation, Public Knowledge, the European Archive (now Internet memory) and the Television Archive. He is a member of the advisory board of the National Digital Information Infrastructure and Preservation Program of the Library of Congress, and is a member of the National Science Foundation Advisory Committee for Cyberinfrastructure. In 2010 he was given an honorary doctorate in computer science from Simmons College, where he studied library science in the 1980s. Kahle and his wife, Mary Austin, run the Kahle/Austin Foundation. The Foundation supports the Free Software Foundation for its GNU project, among other projects, with a total giving of about 4.5 million dollars in 2011. In 2012, Kahle and banking veteran Jordan Modell established Internet Archive Federal Credit Union to serve people in New Brunswick, N.J. and Highland Park, New Jersey, as well as participants in programs that alleviate poverty in those areas. The credit union voluntarily liquidated in 2015. Kahle has been critical of Google's book digitization, especially of Google's exclusivity in restricting other search engines' digital access to the books they archive. In a 2011 talk Kahle described Google's 'snippet' feature as a means of tip-toeing around copyright issues, and expressed his frustration with the lack of a decent loaning system for digital materials. He said the digital transition has moved from local control to central control, non-profit to for-profit, diverse to homogeneous, and from "ruled by law" to "ruled by contract". Kahle stated that even public-domain material published before 1923, and not bound by copyright law, is still bound by Google's contracts and requires permission to be distributed or copied. Kahle reasoned that this trend has emerged for a number of reasons: distribution of information favoring centralization, the economic cost of digitizing books, the issue of library staff without the technical knowledge to build these services, and the decision of the administrators to outsource information services. It's not that expensive. For the cost of 60 miles of highway, we can have a 10 million-book digital library available to a generation that is growing up reading on-screen. Our job is to put the best works of humankind within reach of that generation. Through a simple Web search, a student researching the life of John F. Kennedy should be able to find books from many libraries, and many booksellers—and not be limited to one private library whose titles are available for a fee, controlled by a corporation that can dictate what we are allowed to read. In 1997 Kahle explained that apart from the value for historians' use of these digital archives, they might also help resolve some common infrastructure complaints about the Internet, such as adding reliability to "404 Document not found" errors, contextualizing information to make it more trustworthy, and maintaining navigation to aid in finding related content. Kahle also explained the importance of packaging enough meta-data (information about the information) into the archive, since we don't know what future researchers will be interested in, and that it might be more problematic to find data than to preserve it. "Knowledge lives in lots of different forms over time," Kahle said in 2011. "First it was in people's memories, then it was in manuscripts, then printed books, then microfilm, CD-ROMS, now on the digital internet. Each one of these generations is very important." Voicing a strong reaction to the idea of books simply being thrown away, and inspired by the Svalbard Global Seed Vault, Kahle envisioned collecting one physical copy of every book ever published. "We're not going to get there, but that's our goal," he said. "We want to see books live forever." Pointing out that even digital books have a physical home on a hard drive somewhere, he sees saving the physical artifacts of information storage as a way to hedge against the uncertainty of the future. (Alongside the books, Kahle plans to store the Internet Archive's old servers, which were replaced in 2010.) He began by having conventional shipping containers modified as climate-controlled storage units. Each container can hold about 40,000 volumes, the size of a branch library. As of 2011, Kahle had gathered about 500,000 books. He thinks the warehouse is large enough to hold about a million titles, with each one given a barcode that identifies the cardboard box, pallet and shipping container in which it resides. A given book may be retrieved in about an hour, not to be loaned out but to be used to verify contents recorded in another medium. Book preservation experts commented he'll have to contend with vermin and about a century's worth of books printed on wood pulp paper that disintegrates over time because of its own acidity. Peter Hanff, acting director of the Bancroft Library, the special collections and rare books archive at the University of California, Berkeley, said that just keeping the books on the west coast of the US will save them from the climate fluctuations that are the norm in other parts of the country. 2004 Paul Evan Peters Award from the Coalition of Networked Information (CNI). 2012 Inducted into the Internet Hall of Fame. "The Future of the Internet", Science Friday, 1993, Brewster Kahle, then President of WAIS, participant. ^ "Archiving the Internet / Brewster Kahle makes digital snapshots of Web". SFGate. 1999-05-07. Retrieved 2016-01-29. ^ Benny Evangelista (October 13, 2012). "Brewster Kahle's Internet Archive". San Francisco Chronicle. Retrieved October 13, 2012. ^ A Library as Big as the World, Retrieved January 5, 2015. ^ a b About Brewster Kahle's Blog. Retrieved July 11, 2011. ^ Internet Nostalgia | MIT Admissions MIT Admissions. Retrieved July 11, 2011. ^ Kellogg, Carolyn (August 5, 2011). "Archiving every book ever published". Los Angeles Times. Retrieved 18 August 2011. ^ TONG, JUDY (September 8, 2002). "RESPONSIBLE PARTY – BREWSTER KAHLE; A Library Of the Web, On the Web". New York Times. Retrieved 18 August 2011. ^ "Thank GNUs 2011". Free Software Foundation. Retrieved January 19, 2012. ^ Morrison, David (September 5, 2012). "Internet Pioneer, Former Banker Behind Newest CU". Credit Union Times. p. 3. ^ Strozniak, Peter (December 18, 2015). "Death of a Credit Union: Internet Archive FCU Voluntarily Liquidates". Credit Union Times. Retrieved 18 December 2015. ^ Brewster Kahle. Brewster Kahle's Michigan Talk (Videotape). Ann Arbor, MI at the John Seely Brown Symposium: si.umich.edu. Archived from the original (SWF FLV FLASH OGG MPEG4 WMA WindowsMedia) on August 18, 2011. Retrieved August 18, 2011. ^ Singel, Ryan (May 19, 2009). "Stop the Google Library, Net's Librarian Says". Wired. Retrieved 18 August 2011. ^ "Brewster Kahle receives the Zoia Horn Intellectual Freedom Award". ^ JCARMICHAEL (14 May 2013). "Brewster Kahle to be Honored with 2013 LITA/Library Hi Tech Award". Wikimedia Commons has media related to Brewster Kahle.